To develop a total packaging concept for eight plush Gund toys to be sold in Bloomingdale's during the holiday season. 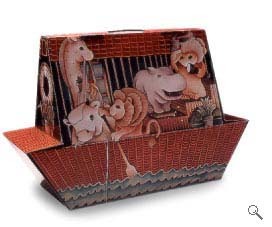 A clever, one-piece Noah's Ark paper construction, gaily illustrated with the eight animals, also serves as a reuseable carrying case. Retailing at $100, the product achieved a 100% sell-through.